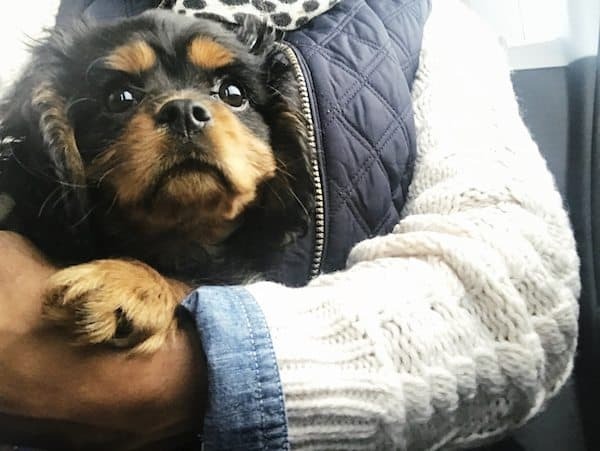 Prev New Year, New Boo: Our Family Takes the Dog Ownership Plunge Next Take to the (Mostly) Friendly Skies with Mom Air! We were feeling slightly disappointed, but mostly impatient. Trying to manage the expectations of a nearly-9-year-old kid can be challenging. Other dog owner friends kept telling us that it will happen soon, we just need to be… well, patient. One of those trust the process type deals. 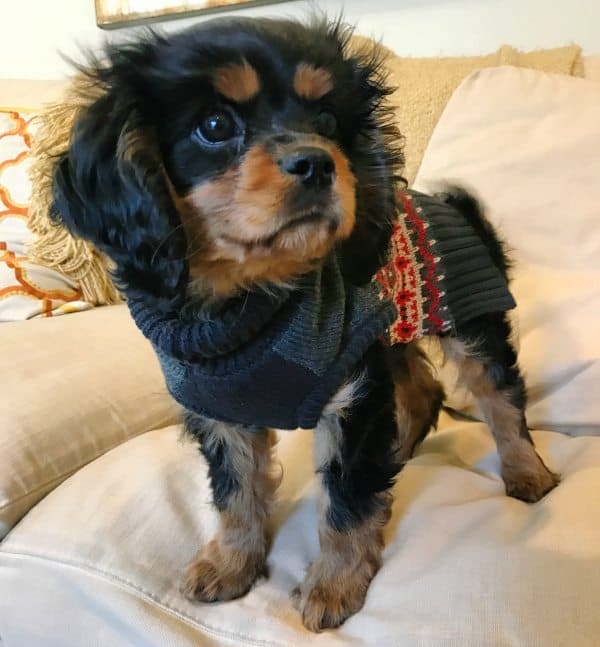 Then a late night search landed me at a wonderful Cavalier King Charles Spaniel breeder living on a farm 45 minutes away. I went deep on my research of this woman and her pets, and it was all coming up smelling pretty sweet. She had a litter of black and tan King Charles puppies back in October and there was one little guy left. I emailed and told her a little about us. In the morning, there was a reply. She and I spoke on the phone to get more information about each other and about the puppy and his environment. Then we arranged for a meet-up. My family and I jumped in the car on the weekend headed to her farm. He is cuuuuuuute to the max, and the minute we laid eyes on his sweet face and serious, brown eye brows, it was a undeniable love story. We left the farm that Saturday, with him wrapped in my arms in the backseat, and went home to this very different life. On that point, let me just say: WHAT?! We weren’t ready. To help the family try to move through this colossal shift in routine, I did what I do as a journalist: research and ask questions. The best information on basically how to survive the first 30 days with a new puppy came from our new vet. She took time to answer every question on my actual full sheet of paper at Murphy’s well-visit. 1) One of the main takeaways from that impromptu info session is: Patience. It is going to be the salve for all the bumps and lumps on this road. 2) Litter mate vs. caregiver. The other helpful advice I got from the vet pertains to my son. The thing is, Murphy has been super excited to the point of being hyper whenever he sees my son. He jumps all over him, licking and nibbling this kid. Murphy has even accidentally scratched The Youngster quite a few times in the clamor to show the boy all the love. Murphy simply cannot get enough of him. As adorable as it is, I asked the vet how we can dial down that frenetic energy. She said that right now, Murphy views my son as his litter mate. That translates to it being total playtime whenever the puppy sees him. Her advice was simple and made so much sense. Get my son involved with the business end of Murphy’s care. Setting out his food. Changing his water in the bowl. Taking him out to potty. All of these things will help signal to Murphy that the kid is part of the leader team and not another puppy in the pack. Setting out his food? Sure. Giving him fresh water? On it. Dealing with the poop? Um, we’re working on it. Here are a few links to pieces that I found very helpful for Puppy Life 101. If you have any good ones or great advice to add, I’m all ears! 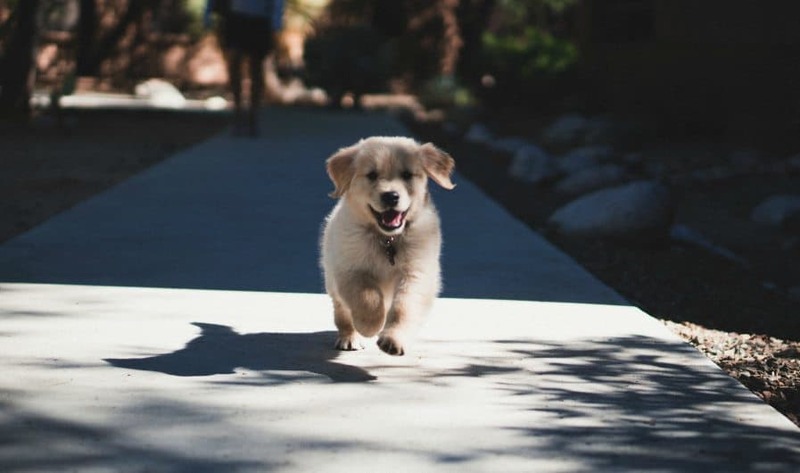 Ultimate Puppy Guide: Famous “dog whisperer” Cesar Millan’s site offers a great, comprehensive list of things to know about caring for a puppy, with sub links to posts on potty training, must-have gear, crate training, what to expect at vet appointments, and even guidelines for how to choose the right vet for your dog. American Kennel Club’s “How Much Do Puppies Sleep“: As with babies, puppies need to sleep a lot. According to the post, they typically sleep 15 to 20 hours a day. The post gives great tips on how to set up a good sleep schedule and routine so puppies gets nourishing rest. Nicole Blades is a novelist, speaker, and journalist. She started at Essence magazine, later co-founded the online magazine SheNetworks, and worked as an editor at ESPN and Women’s Health. Nicole’s work has appeared in The New York Times, Cosmopolitan, Women’s Health, Good Housekeeping, WashingtonPost.com, MarieClaire.com, and BuzzFeed. Her latest book,HAVE YOU MET NORA?, is out now, along with her previous novels THE THUNDER BENEATH US (Kensington, 2016) and EARTH’S WATERS (DC Books, 2007). Listen to her weekly podcast, Hey,Sis!, about women finding their focus and place in business, art, culture, and life. Nicole lives in Connecticut with her husband and their 9 year-old son. And find out more at: NicoleBlades.com. Congratulations on the addition to your family!